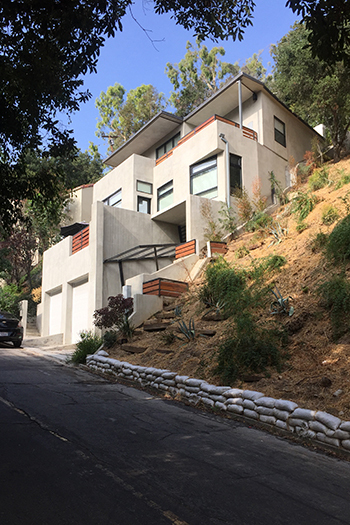 On a steep hillside lot in South Pasadena, this residence is designed to float, to take advantage of an idiosyncratic flattening of the grade, and achieve a less intensive relationship to its site. Architecturally, the result is spaces subtly offset from one another, with distinct, focused views and differing qualities of light from one room to the next. Two living levels are sheared; slipping apart, they compound the effect as you move up the hill. A central stair continues this process vertically, and light and views of the sky penetrate the home from above.